BENGHAZI, Libya (AP) — Residents of Libya's second-largest city warned on Saturday of a "revolution" to get rid of armed militias and Islamic extremists after protests spurred in part by the killing of the U.S. ambassador left four dead in an unprecedented eruption of public frustration. In a sign of how weak the country's post-Moammar Gadhafi leadership remains, authorities tried to stem popular anger, pleading that some of the militias are needed to keep the country safe since the police and army are incapable of doing so. A mass protest Friday against militias against the compounds of several armed groups in Benghazi lasted into early Saturday, as thousands stormed the headquarters of Ansar al-Shariah, an Islamic extremist group suspected in the Sept. 11 attack on the U.S. Consulate. They drove out the Ansar gunmen and set fire to cars in the compound — once a major base for Gadhafi's feared security forces — and then moved onto the base of a second Islamist militia, the Rafallah Sahati Brigade. Brigade fighters opened fire to keep the protesters at bay. The state news agency said four protesters were killed and 70 injured in the overnight violence. There were no new protests on Saturday, but the city of 1 million in eastern Libya was brimming with anger, rumors and conspiracy theories. The bodies of six soldiers were found in the morning dumped on the outskirts of the city, shot through the forehead and their hands cuffed, state TV reported. An army colonel was reported missing, feared kidnapped. Some militiamen bitterly accused Gadhafi loyalists of fueling the protests. Some media reports accused militiamen of taking revenge on Gadhafi-era veterans in the military, while military spokesman Ali al-Shakhli blamed Gadhafi loyalists. 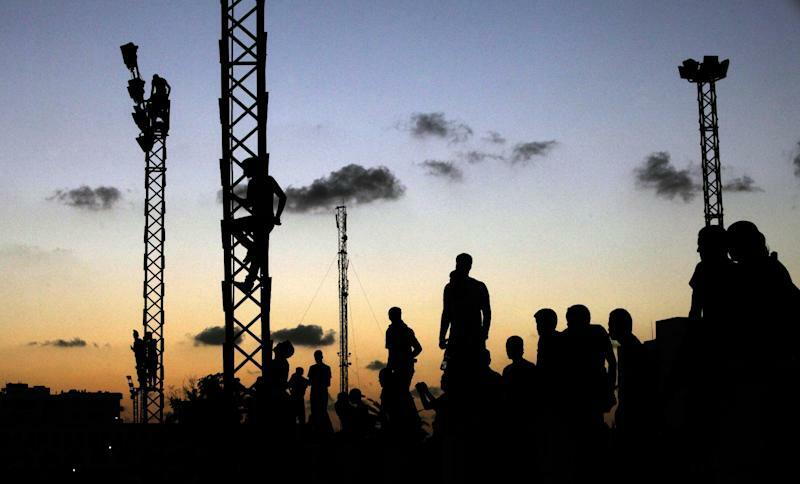 Backers of the ousted regime continue to hold sway in some parts of the country, particularly the western city of Bani Walid and parts of the deep south. Gadhafi loyalists near the southern town of Barek al-Shati have been clashing with a pro-government militia for several days, killing nearly 20, and abducted 30 militiamen from a bus, according to Essam al-Katous, a senior security official. Since Gadhafi's ouster and death around a year ago, a series of interim leaders have struggled to build the state from scratch and bring order to a country that was eviscerated under his 42-year regime, with security forces and the military intentionally kept weak and government institutions hollowed of authority. The militias, which arose as people took up arms to fight Gadhafi during last year's eight-month civil war, bristle with heavy weapons, pay little attention to national authorities and are accused by some of acting like gangs, carrying out killings. Islamist militias often push their demands for enforcement of strict Shariah law. Yet, authorities need them. The Rafallah Sahati Brigade kept security in Benghazi during national elections this year. Its compound, once a Gadhafi residence, contains a prison and protects a large collection of seized weapons. Ansar al-Shariah guards Benghazi's main Jalaa Hospital, putting a stop to frequent attacks against it by gunmen. On Saturday morning, armed Rafallah Sahati militiamen — weary from the clashes the night before — guarded the entrance to their compound, standing next to charred cars. The fighters, some in military uniforms, others dressed in Afghan Mujahedeen-style outfits, were indignant. "Those you call protesters are looters and thieves," said Nour Eddin al-Haddad, a young man with an automatic rifle slung on his back. "We fought for the revolution. We are the real revolutionaries." The government has brought some militias nominally under the authority of the military or Interior Ministry, but even those retain separate commanders and often are only superficially subordinate to the state. In an attempt to assuage public anger and show renegades are being brought under control, some of those "legitimate" militiamen were installed at some militia compounds around Benghazi on Saturday. By Saturday afternoon, the Rafallah Sahati Brigade headquarters was being guarded by members of another "legitimate" militia from the western city of Zawiya. Activists and protesters, however, say the militias must disband and their fighters individually be integrated into the army and security forces. Protesters said in a statement they would return to the streets on Friday if they still see militias operating. If the government doesn't act, "there will be a second revolution and the spark will be Benghazi," lawyer Ibrahim al-Aribi. "We want stability and rule of law so we can start building the state, but the Tripoli government appears to have not yet quite understood people's demands." Farag Akwash, a 22-year-old protester wounded in the arm during the night's clashes, insisted, "We don't want to see militias in the city anymore. We only want to see army and police." The Sept. 11 attack against the U.S. Consulate that killed Ambassador Chris Stevens and three other Americans galvanized public anger against the militias. Some 30,000 people marched through Benghazi on Friday to the gates of the Ansar al-Shariah compound, demanding the groups disband. The storming of the compound came hours later after the march ended. Protesters also stormed into the Jalaa Hospital, driving out Ansar fighters there. 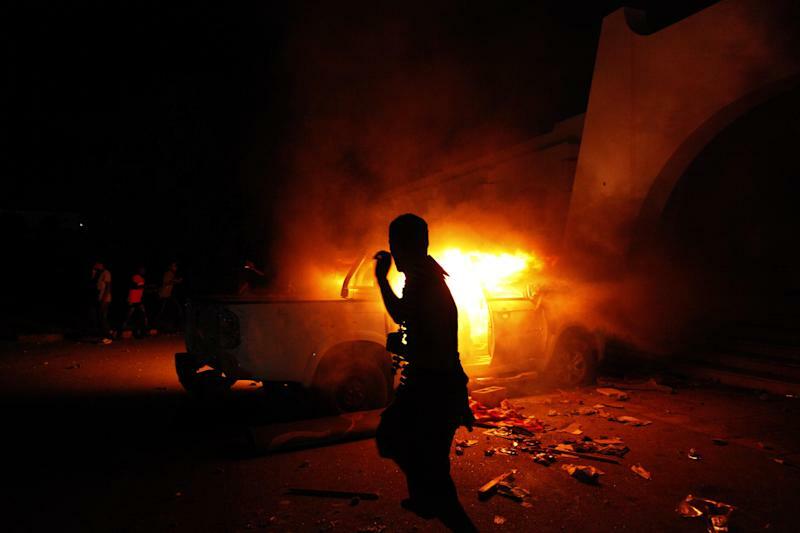 The unrest comes at a time when the power vacuum in Libya continues. The first post-Gadhafi national elections in May chose a national assembly that is serving as a parliament and that chose the new president, Mohammed el-Megaref, and a prime minister, Mustafa Abushagur. But Abushagur, believed to have struck an alliance with the Muslim Brotherhood, has yet to form a cabinet. Members of the assembly are pressing him to replace the interior and defense ministers in charge of security forces and the military. El-Megaref called on protesters to leave alone militias that are "under state legitimacy, and go home." Omar Humidan, assembly spokesman, acknowledged that militias "have wrong practices ... serve their own agenda and have their own ideology." But he warned that "striking these militias and demanding they disband immediately will have grave consequences." "The state has a weak army and no way it can fill any vacuum resulting in eviction of these militias," he said. "The state must be given time." Aside from Rafallah Sahati, there are two other major militias in Benghazi that authorities rely on. One is called Libya Shield, led by Wassam Bin Hamaad, an Islamist who has resolved tribal disputes. Another is the Feb. 17 Brigade, led by Fawzi Abu Kataf, who is seen as connected to the Muslim Brotherhood. The militia is believed to be the closest to the state authorities and has helped secure borders. Fathi Fadhali, a prominent Islamist thinker in Benghazi, said the description of some militias as "legitimate" just contradicts common sense. "How can you be a militia and legitimate at the same time?" he said. "How do you leave a group of extremists taking charge of security?" "The state must interfere as soon as possible — even, excuse me to say it, by using force — before everything collapses. I am extremely worried."